Have you heard of a Vegan Cheesecake? Here’s a fresh new recipe for a Mango Cheesecake for satisfying the sweet tooth craving in all of us. I made just the right bite size cheesecake so you do not feel guilty for gobbling away a couple of these after dinner. I have only recently started to experiment on cheesecake varieties and decided to try with my favorite fruit, mango. With just a couple of trials, I got the creamy consistency a cheesecake ought to have. 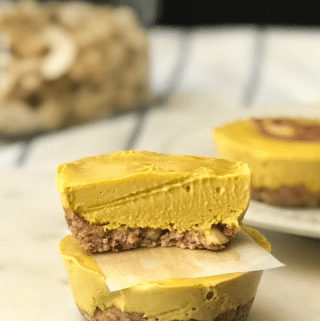 Another reason for trying these cheesecakes at home is the price tag on a vegan cheesecake pie at the store. Why plunk down $10 for a six-inch pie when you can enjoy better tasting version for far less?! The feedback and the reaction I got from my kids told me all I needed to know as for how valuable it was! 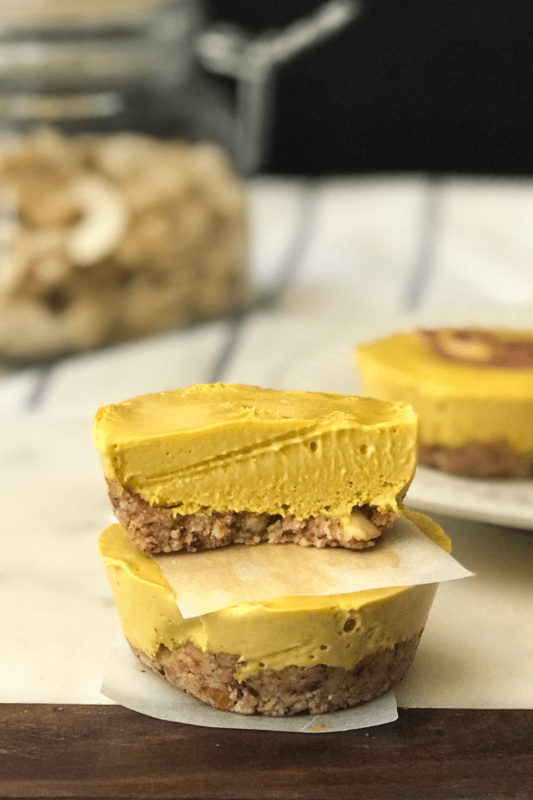 Here are some key information about vegan mango cheesecakes. 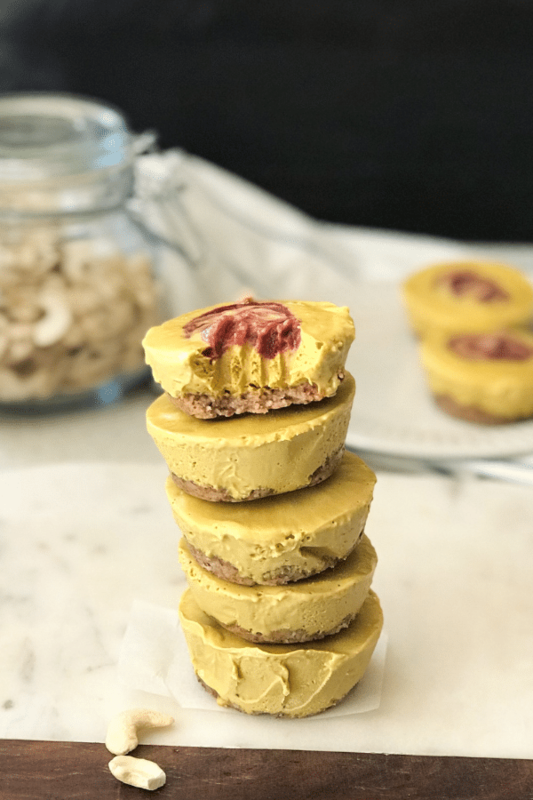 What Are The Main Ingredients In Mini Mango Turmeric Cheesecake? Soak the cashews for at least 4-6 hours. If you missed this, be sure to soak them in hot water for an hour so. This is one big reason for the creaminess. The crust can be prepared with any nuts like pecans, walnuts, hazelnuts. Refrigerate the coconut milk until the top layer gets thick. You only need the top layer for cheesecake. 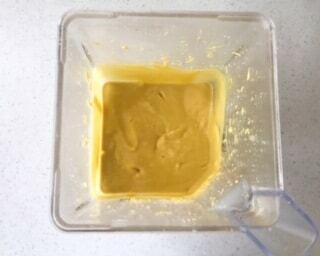 Any blender is good for blending the cheesecake batter. Just make sure your cake batter is creamy and smooth. The mini version of cheesecake needs cupcake holders. Just grease the cups with a little vegan butter or oil. Place a parchment paper strip in between the cups. (This idea is inspired by minimalist baker). Now you can lift the vegan cheesecake once it’s done. Or, you could also use a cupcake liner. Do not skip coconut oil. That’s what makes your cheesecake smooth and creamy. Otherwise, you will see an icy look on the top layer of the cake. You can add any toppings, today I have added the homemade mixed fruit jam. Apart from adding a wonderful color and flavor contrast, turmeric is an ingredient that brings balance to the recipe. Its anti-inflammatory nature is a good feature for a dessert recipe such as cheesecake. Turmeric has been used in India for thousands of years as a spice and medicinal herb. It is an anti-inflammatory and helps healthy cholesterol levels. To know more health benefits of turmeric click here. If you are preparing the cheesecake, it can be made in any pan(small round, or square shaped). I like the mini version because it is easier to serve kids this way. 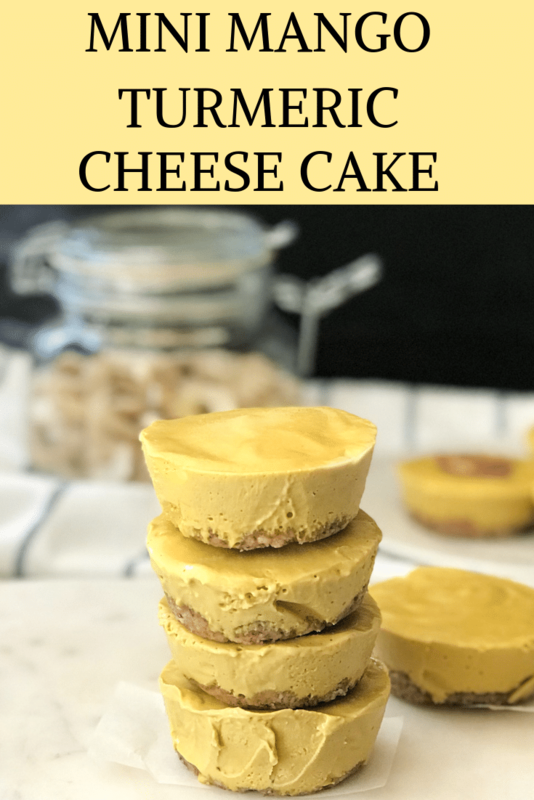 If you are a fan of vegan cheesecake, let me know your favorite kind in the comments below and I will be sure to post a recipe on the popular ones. 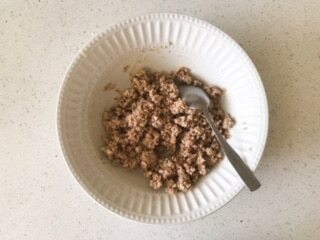 As of this writing, I am trying a few different flavors and I will share my successes soon…. If this recipe interests you, look for similar mango recipes like mango mousse, mango kulfi. Here are the recipe details…. 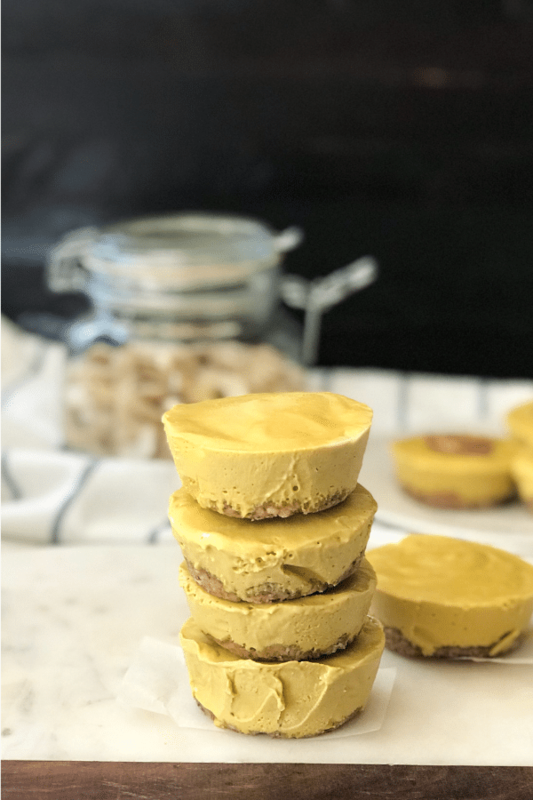 This soy-free, gluten-free, and dairy-free vegan mango turmeric cheesecake version is primarily made with soaked cashews and coconut milk. Soak the cashews overnight or for at least 4 hours. To prepare the crust, blend the almonds in blender or food processor to a coarse powder consistency. Add 3 tbsp agave and 1 tsp coconut oil to this and mix well. 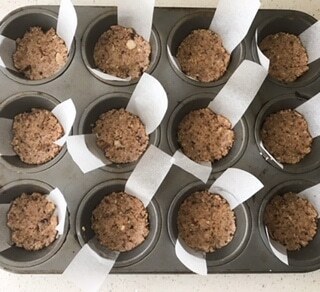 Now place the crust dough in the cupcake molds and apply some pressure on them with a spoon until it forms a tight base. 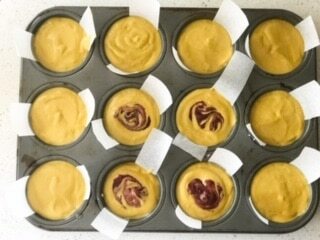 Place the cupcake molds inside the refrigerator until the mango cheesecake batter is ready. Chop the mangoes and blend with 1 cup soaked cashews, 3 tbsp coconut milk cream, turmeric, 4 tbsp agave, 2 tsp lemon juice into a smooth and creamy consistency. Pour the batter inside the cupcake holder and remove any bubbles by taping 1 or 2 times. Cover with food wrap and freeze it for 4-6 hours. Mango Cheesecake is ready! Serve chilled as a scrumptious dessert! Coconut cream = Coconut milk top layer fat. Place the canned coconut milk in the fridge before using for the recipe. And use only top layer cream.